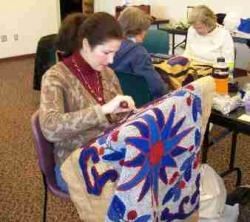 The Brandywine Rug Hooking Guild is hosting a special raffle to benefit the 2011 ATHA Biennial to be held in Lancaster. Two designer vintage rugs were recently donated and then completed by members of our guild. The late Billie Smith had started hooking these rugs in the 1970s, and they were completed by various members of our guild and then bound by Joyce Richenbach. "Chestnut Leaf Border" (46 x 86") is a design of Louise Hunter Zeiser and is described in the vintage Heirloom Rugs catalog as an old fashioned geometric with a broad chestnut leaf border. "Mariner's Star" (28 x 47") is a design of Lib Calloway. We are grateful to Billie's daughter Susan for donating these rugs to us. The raffle was held in September just prior to the biennial. First and second place winners were Barbara Dove and Anne Geiger. The rugs were on display in the 2011 Biennial exhibit before being claimed by the winners. Thank you to all who participated in this successful fund raiser.